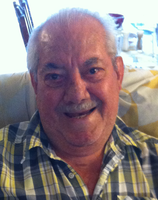 Provide comfort for the family of Umberto Cazzorla with a meaningful gesture of sympathy. Umberto (Albert) Cazzorla, after a long struggle with cancer and surrounded by his family, passed away Dec. 4, 2018, in St. Boniface Palliative Care. He is precdeceased by his wife Antonia and 8 siblings. He is survived by his son Frank Cazzorla (Kerry), grandson David C. (Natalie) with a great grandson Carter and grandson Paul C. (Mitchell), as well as dozens of nieces, nephews, and cousins too numerous to name. Born Oct. 20, 1928, in Monopoli, Italy, Umberto, being the youngest of the 8 siblings, left Italy to go to Belgium, then immigrated to Canada in 1955, arriving in Eastern Canada on the ship Banner Bail. He travelled from Eastern Canada by train to settle in Winnipeg, later bringing over his wife. Umberto worked hard at a variety of jobs, from farm work to full time at SuperCrete learning 3 languages along the way. Later he established his own business and created the then well known "Albert's Pool Hall" on Corydon. After closure of the pool hall, Albert retired but stayed active in the community of Corydon playing cards with friends, growing his tomatoes, basil and other garden loves. Albert enjoyed dancing, socializing, making wine-then drinking his home made wine, as well as fishing /hunting with friends at Seven Sisters. Albert, when able, tried to enjoy life. Later in life, Albert loved the blessings of regular visits which his grandsons brought; from visits of David with Carter who ran ahead of Grampie's walker on the sidewalk , or visits with Paul who provided Espresso coffee and special personal care needs. We are glad that Albert is now at peace and joined with Tony, yet a big hole has been made in our lives which we will now fill with pictures, memories of times and events of great food that only Albert could make. We are thankful to all those that helped make our journey and Albert's life easier. Condolences will be received by the family at 10:00 am followed by the Mass of Christian Burial at 11:00 AM on Friday, December 7, 2018 at Holy Rosary Roman Catholic Church, 510 River Ave., Rev. Father Sam Argenziano presiding. Entombment will follow in the Queen of Heaven Mausoleum, at Assumption Cemetery, 3990 Portage Ave.
To send flowers in memory of Umberto Cazzorla, please visit our Heartfelt Sympathies Store. We encourage you to share your most beloved memories of Umberto here, so that the family and other loved ones can always see it. You can upload cherished photographs, or share your favorite stories, and can even comment on those shared by others.